The past few days, bounty hunters from every corner of Evan have descended upon the four regions of Somerset, Gateway, Elmsfield and Badlands. With more weapons than an American postal official, they have come to collect some respect and cash. Local pirates are being kept busy with the continual surprise attacks from these tenacious characters, while the more wholesome gangs are just as busy defending themselves from the paid contract killings being indiscriminately placed on their heads. `Eets gettin` so ah man can`t do his business, wit out fearin fur his life. I was smookin by meself, mon, in dah bat room, when a boonty mon jump outta dah next stall. Eeh had a machete dah size of me arm, mon. I had to stop jerking my chicken [editors note: he is referring to his lunch Jerk Chicken] and beat dah mon down wit me fists. Evans has become even more dangerous den it was before, mon`, claims Booker Boomer of the gang Bumbleclot, as he takes a few tugs on an obscenely large pipe. When will the bounty slayings end? It is hard to say. One thing apparent is that large sums of money are being passed hand-to-hand in the dark back alleys of every city, with sinister acts of murder as the commodity being sold. It is too early to guess. For every contract they fill, for every squad they decimate, the bounty hunters seem to lose a squad of their own. The pirates, traders and vigilantes of Evan are fighting back. Killing is now a business, and business is good. An unfortunate Moose, or at least what appears to have been once a Moose, falls victim to the Car-tapult`s excellent armor penetration abilities. 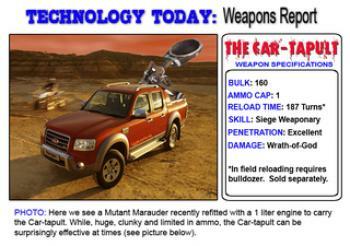 So, whether going out for a quck scout, or besieging a town or fortification, the Car-tapult proves to be an effective, if somewhat limited, weapons system. The most wanted gangs in Evan today are listed below. The bounty listed for each gang is a combination of the amount offered by local vigilante groups and by disgrunted individuals, and represents the amount of money you would expect to be paid for each senior member of the gang you kill. 1. THE EMPIRE Somerset: 2354. 2. the mad mad crushers Somerset: 576. 3. King Cobras Badlands Truckstop: 543. 4. Napalm Lullaby Badlands Truckstop: 520. 5. The Corpse Punchers Somerset: 319. 6. Twisted Sisters Somerset: 251. 7. Fish Heads Somerset: 206. 8. The Arachnids Gateway Truckstop: 184. As part of our occasional roundup of the most busy gangs in Evan right now, we can report the following. The most active gang on the deathsport circuit has been SD Rollers. Their most favoured type of event has been the deathrace, although they have also competed in numerous race events. 1. Cover 6, owned by Inzpired. 2. ss hunt, owned by the mad mad crushers. 3. Pirate Hunter, owned by Lupos. 4. SomerStantial, owned by Famiglia Rivera. 5. Slime Time, owned by The Corpse Punchers. This list shows just who has been winning the most lucrative prizes on the circuits and arenas of Evan, during the past month. 5. Advanced Research labs: 47600. When preparing for scout, the other gangs snicker and grin when I pull up in my Chomper with a 3.2L exposed engine. I used to ignore them, but now it has gotten to the point where they refuse to allow me to come on scouts with this vehicle. Is there any reason you can guess as to why they are treating me so coldly? I was going to initially suggest they might be treating you that way because you are an obnoxious jerk who breath is so bad it could knock a maggot off a rotting corpse. But, since I can occasionally be nice, I have decided to provide you the real reason for their reluctance. Did you know that bringing a vehicle with an exposed engine on a scout is the wasteland equivalent of marching around the woods on the first day of hunting in a helmet with antlers on it? No matter how well your vehicle is armored, no matter where the enemy`s firing position is, you can almost guarantee their shots will travel into your engine`s hood scoop, damage your engine, and possibly set all occupants on fire. Your friends are trying to help you, so quit trying to compensate for your lack of manliness and bring an engine that properly fits under the hood. You`ll thank yourself for it. Is it too much to ask for a driver that can pilot my cars AND hit something with the mounted weapon they are assigned to? It seems I spend more time shooting the sand than the mutants, even if the car is totally stopped. Sheesh! You want the poor guy to drive well enough to evade enemy fire and also effectively shoot back at the bad guys? I have news for you, Mr. Demandington: It isn`t going to happen. Did you know that the tighter your steering wheel is turned, the more difficult it is for the driver to hit his assigned targets? This seems to be the case even when your vehicle is completely stopped. 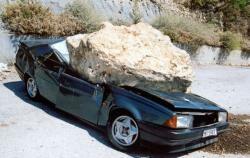 So, if you must rely on your driver`s firing support, be sure that steering wheel is as straight as you can get it. You know, `straight`, as in the opposite of your sexual orientation. I think my friend is a closet pirate. I often see him lustfully eyeing the trade convoys in town, and he has replaced the word `yes` with `yar` in his vocabulary. He sneaks out late at night to go scouting by himself and he often comes back with lots of water and other supplies. When I ask them where he got them, he just tells me they `fell off a truck`. I am upset that he is possibly lying to me and even more upset that he is possibly a pirate. What should I do? This is a big world filled with a lot of people with different standards. If your friend is too ashamed to admit he is a filthy, dirty raider, and you are too much of a milquetoast to immediately cut his heart out with a broken bottle in case he is, then you must live and let live. Besides, maybe you can secretly find proof he is truly a pirate, and blackmail him for all he`s got. Blackmail is typically wrong, but not when you do it to a pirate. Another option you have is to get him to take the `Am I Pirate? Quiz` in an upcoming issue of the Darkwind Gazette! Like all great papers, Darkwind Gazette needs an obituary to mark the passing of our greatest warriors into the Halls of Valhalla. Now, get out there with your best members and start dying. After all, you are never really famous until you are slowly cooling to room temperature! Death`s Door pays a six-foot deep acknowledgment to Jason Voorhees of the gang Dead Celebrity. 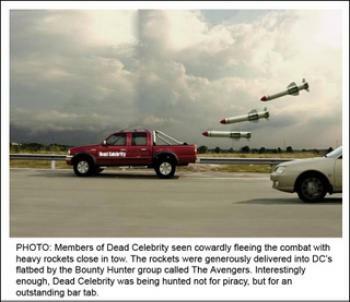 Apparently, no one told him that looted Blitzer came with extra rockets. Luckily, the Northern Mutant Alliance caught up with him outside the gates of Somerset, and made sure he got every rocket he forgot to loot. Kids are still finding bits of Jason when they climb on the roof to recover their footballs and frisbees, so someone get a bucket to gather enough of him to send back to mom. For the time being, if you would like to see the passing of your gang`s members acknowledged in print, please send manglemybadger a private IM. Please include who he was, who killed him, what he was doing when he died, what his best skill was, and, of course, a grisly description of his killing wounds. I will get them printed up here! We`re paying tribute to the legendary Earnest 'Minimi' Slaughter, a renowned large guns specialist from Advanced Research labs. Current DW Gazette Editors: Sam, Racing Robbie, Ayjona, JD_Basher, Bastille, Rezeak, Fifth, SmokeyKilla.